Thirty years on from the Hillsborough disaster and with respect pouring in from across world football, Jeff Goulding pens a touching tribute to a human tragedy. 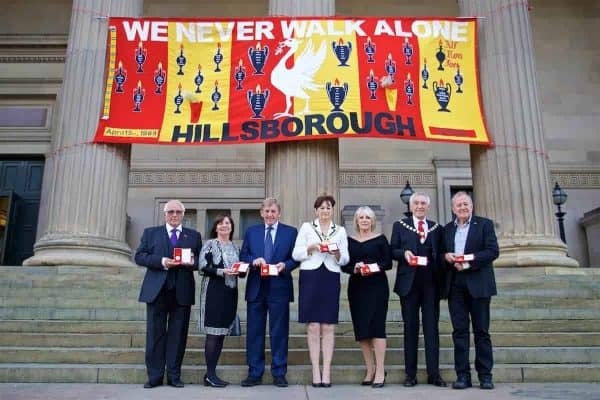 Hillsborough is a tragedy that has become synonymous with one city. 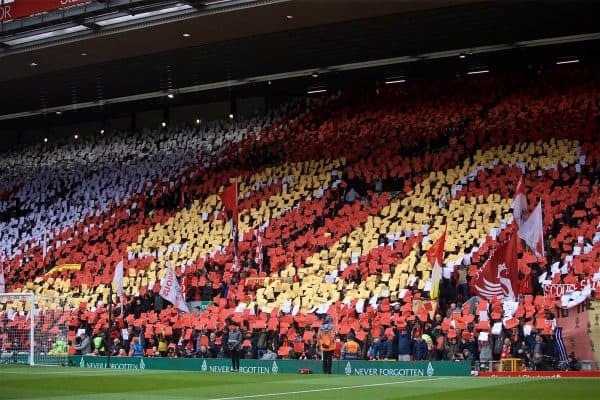 Today, touching tributes have poured in once again from across the world of football, all of them offering their support and solidarity with the people of Liverpool. They are all gratefully received. However, the ramifications of the disaster that unfolded in Sheffield 30 years ago today have been felt far beyond the confines of the city of Liverpool. 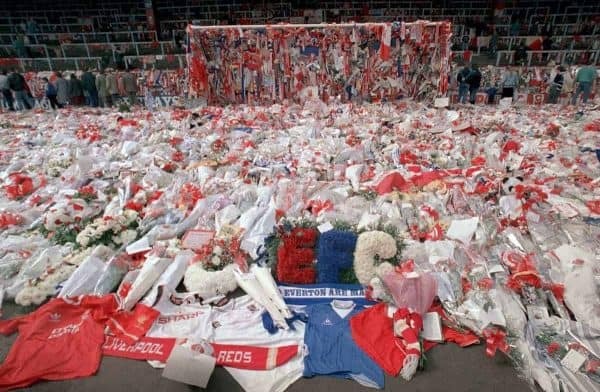 Hillsborough is the country’s tragedy; it is football’s tragedy. The idea that Hillsborough is purely a Liverpool issue has led to several unhelpful attitudes and behaviours over the years. At the time of the disaster it made it easier for some to shift responsibility onto a city that had already been cast in the role England’s troublesome child. Much later a column edited by Boris Johnson wrongly branded Liverpool as a ‘self-pity city’. This deepened the hurt and made the campaign for truth and justice much harder to fight. Sadly, today we hear these ideas parroted still on the terraces of football grounds around the country. Supporters of other English clubs still sing about Scousers who, they say, have a victim mentality. In doing so they unwittingly participate in the sort of stereotyping and victim blaming that has exacerbated the pain and misery that has plagued the survivors and families of the deceased for 30 years. It also ignores the fact that Hillsborough could easily have happened to supporters of any English club. The Hillsborough Independent Panel Report highlighted several incidents, prior to 1989, in which a similar disaster could have happened. Nor is the public or football supporters’ interests served when we turn on each other in the name of ‘banter’. Then there is the very real hurt caused to the many of the victims of Hillsborough who are not from Liverpool, but who have suffered greatly in its aftermath. Forty-one of the 96 who perished were from other parts of the UK. Their families are rightly just as angry and equally vocal. Louise Brookes, the sister of Mark Brookes, who died in the Sheffield catastrophe, lays this out in a statement to a government report into the treatment of the Hillsborough families. The report is entitled ‘The patronising disposition of unaccountable power’, and it is authored by the Right Reverend James Jones. “The survivors are also from all over the UK. Two of the lads who tried to save my brother were from Devon. Five out of the seven women who died were from London. Invisible. How utterly debilitating and despairing must it feel to believe that your experience has been overlooked. How hard must it be to labour on for decades, fighting for truth and justice and to feel that you are invisible? Many of us who were born and raised in Liverpool are immensely proud of the way our city has come together in the aftermath of the tragedy. We are not defined by the tragedy, but I believe we are defined by our response to it. We could have fractured, we could have succumbed to the many unnecessary challenges that came our way, but we didn’t. Instead we united and stood shoulder to shoulder with each other. Irrespective of our footballing allegiances we all saw that this was a human disaster. We believed and still feel that an injury to one of us is an injury to all of us. I will always be proud of Liverpool for this. However, those who campaigned tirelessly came from all corners of the country. There are bereaved families in London and other places who feel the pain and anger every bit as much as any Scouser. Many of the survivors and those who fought to save the lives of the stricken and injured on the pitch that day came from all over the land, not just from Liverpool. They were simply ordinary people placed in extraordinary circumstances. 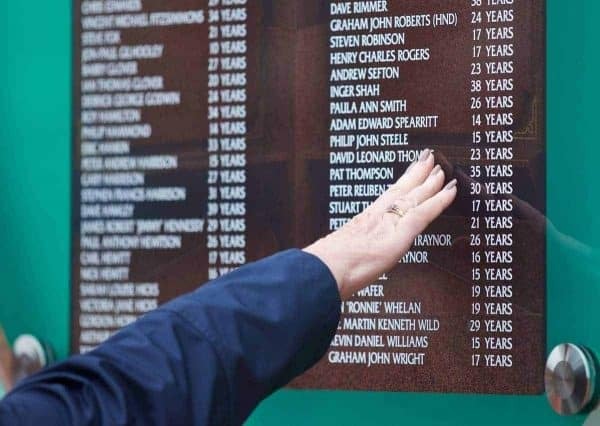 All of those involved would have chosen to continue their ordinary lives over the horror they witnessed; content to consider Hillsborough as the name of an ordinary football ground, instead of the all-consuming memory it has become. Many survivors feel that way, rather than wallowing in self-pity, they wish they’d never heard of the word Hillsborough. No one involved should be defined by the disaster itself, nor by their city of their birth. So, as we move past yet another milestone in the post-Hillsborough landscape, we should recognise now more than ever that Hillsborough was a human catastrophe that touched not just one city but the world of football and beyond. It is also one whose lessons have meaning for all of us, regardless of who we are or where we are from. “…there can be no closure to love, nor should there be for someone you have loved and lost. Furthermore, grief is a journey without a destination. “The bereaved travel through a landscape of memories and thoughts of what might have been. This is equally true for those who have suffered the loss of someone they care for as it is for those who mourn the loss of the life they once knew or the future they will never know. Only by our actions can we contribute to that journey. Our solidarity with all those affected by the disaster in whatever way, and wherever they are from, is as important now as it has been at any time in the last three decades. It will continue to be for years to come. If the tragedy teaches us anything at all, it is that there is strength in unity of purpose and solidarity between people. That applies to all of us, regardless of our club allegiances or city of birth. 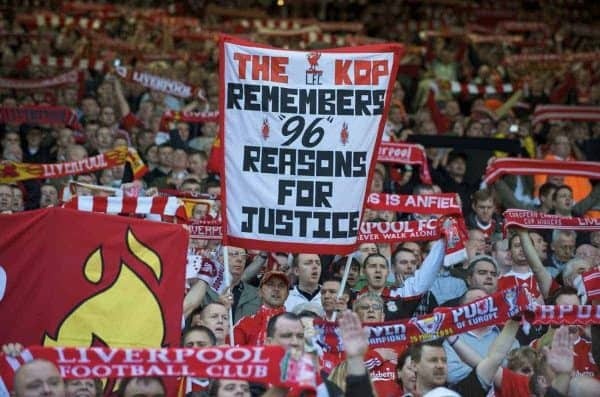 Justice for the 96, justice for all.